Eschatology Refers to the biblical doctrine and study of last things. Usually focused on the return of Christ at the end of the age. This blog is being setup to assist in the Models of Eschatology study course at United Christian Church in Richmond, Virginia which began January 23, 2008 and continues Wednesday evenings at 6:30 pm for about one hour. Next class 4/23/08. After the Wednesday night study session that week’s overheads will be posted and an outline of the weeks notes (time permitting) to allow those who weren’t able to make it to that week’s class to stay current with the material covered that week. As I have time to learn better how to use the features of this blog I may create a comments section (if I have time to monitor it and keep those of opposing view points from acting unchristian towards one another), a dictionary of eschatological terms, invite people in different camps to write articles defending their view point, create links to web sites related to the different models, and whatever else helps to make this a more informative blog. We’ll see how my time goes after we finish the study course and see if there is interest in keeping this blog going after the course is finished. Below is the outline for the study course. The color code will help you instantly determine which category of model the overhead belongs to by looking at the colored bar at the bottom of the overhead. Every image that gets posted in the blog won’t have the color code on it, but the overheads used in class will. 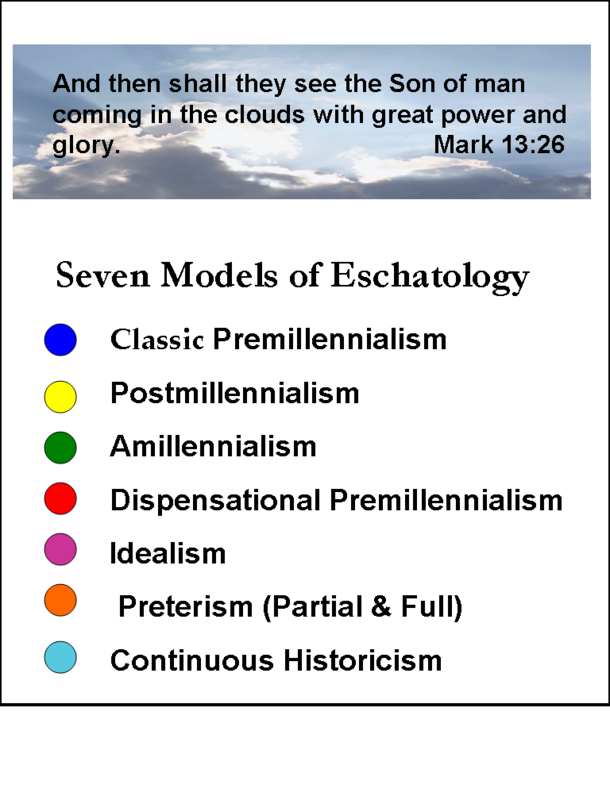 Take the poll and vote on your preferred model of eschatology. Daily Verse from the ESV (hold mouse over link to view).